#1 Why You Should Carry a Gun? Digital technology has enabled manufacturers to install electronic keypads to the security of safes and lockers. Electronic keypads are operated through a series and combinations of numbers, which becomes the unique password of an individual owner. These passwords are the only way to open the safe, without which, the safe will not budge. This is one of the best options, gun owners have, to secure their firearms safely. The distinctive passwords enable them to gain access to their possessions quickly, and feel secure that another person will not have the same freedom. Ease of use, and the availability of master keys make digital gun safes, a very good product to invest in. They will hold the guns and valuables secure in all kinds of adversities. Keypads on the lockers, which are digitally enhanced, will usually have numbers and symbols printed on them. The user can choose a combination of any of these keys, which will then become their security password. This password should be kept a secret in all times, giving it away will prove fatal, as the firearms and possessions saved in the locker can be accessed by others. Adults in the family, who are responsible and have a stable mind can be given access to the safe. Otherwise it is dangerous to keep firearms readily available to immature or unstable individuals. There are times when, either by mistake or by burglars, the password is entered incorrectly many times. This usually happens when an unauthorized person is trying to pry open the safe. The owner of the safe has an option to set a certain number, which indicates after how many trials, the password needs to be erased. This is added security to the belongings. The working password will only erase itself, the owner can eventually have access to their valuables though the master password. The same situation will prevail when the batteries run out too. Digital electronic locks on safes work on electricity. This power is either supplied through a plug or batteries. Most electronic safes come with external keypads and batteries. This helps to change the batteries when they need replacement. The keypad is also able to indicate the percentage of power the battery possesses. When the user notices that the battery is running low, they can easily replace them. Changing battery, thus, whenever required, will keep the password working, the locker secure and help in keeping ones belongings safe and sound. Digital electronic lockers are some of the most reliable type of locking systems invented by manufacturers. They provide the user, the benefit of traveling key less, knowing that their lockers are safe, as long as they have the sole possession of their password. Misplacing keys, trying to find them, calling a locksmith, etc are tedious jobs. They involve a lot of time and effort which can be easily avoided with the usage of digital keypads on safes. 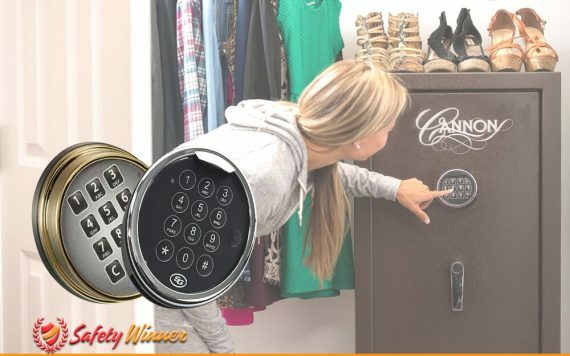 With all the benefits of a digital keypad for a gun safe, it can be noted that it provides an easy way for the user to open and close the locker. With the entry of the password, it opens, after which the door can be clicked back to automatically lock it into place. Even in times of emergencies, the users need not fumble around with keys or worse, try to look for the key. They can simply punch in their password to have an entry into their locker. Electronic lock gun safes need very less maintenance. The user themselves need to ensure that the batteries are always replaced when they run low. Unless there is a factory defaulted piece, the electronic lock will run many years without causing any trouble. However, customers need to educate themselves on the warranty terms of the brand they are purchasing, this will help in replacements and necessary repairs.